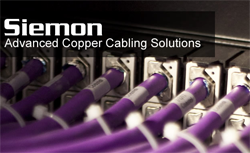 Established in 1903 and headquartered in Connecticut, USA, Siemon delivers over a century of innovation focused on helping network professionals deploy high quality, high performance cabling infrastructure. From the core products contractors need every day, to cutting edge data center ecosystems of the future, Siemon’s comprehensive suite of end-to-end copper and optical fiber cabling systems, cabinets, racks and cable management solutions has the network professional covered. What’s the most efficient way to connect IP-enabled IoT and smart building devices? Z-PLUG exceeds all Category 6A performance requirements for 10Gb/s, easily supporting high-speed applications like 802.11ac Wi-Fi today, and delivering future-proof connectivity for tomorrow. 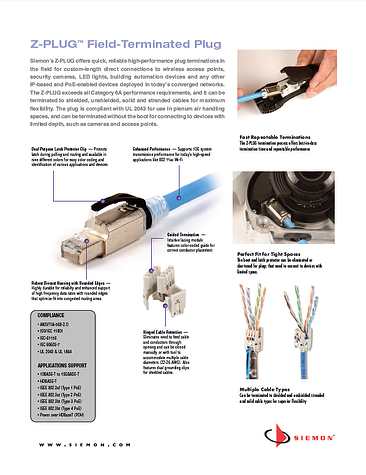 The innovative Z-PLUG tool-based termination process is simple, intuitive, user friendly, and FAST – enabling best-in-class termination speed for rapid device deployment. 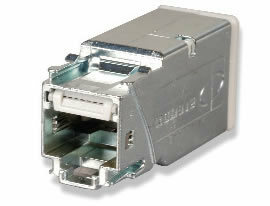 Z-PLUG terminates shielded and UTP, solid and stranded Category 6A and Category 6 cable in conductor sizes from 22 to 26 gauge, allowing it to be easily deployed in a wide range of projects and applications – all with a single part number.